No matter how much you care for your dog, there is always a chance that he or she will pick up some nasties like worms, fleas or ticks. Knowledge is the key and lately I’ve been deepening mine on the website called Parasite Party… weird name for a site I know, but you can learn a lot there; all about the weird and wonderful world of dog parasites. Parasite Party provides us with some basic knowledge about each potential parasite including information on how our dogs might get them in the first place and how they will show up so you can tell your dog is infected. There is also a “one minute check” test which allows us to determine what kind of risks your dog is exposed to and what we should know about it. Just 6 simple questions which will give you some understanding about the risks to your dog. You have roundworm, hookworm, whipworm, heartworm as well as the traditional tick and flea. These are also other worms which can affect our pets – ask your vet for further advice about the risk for your dog. Worms are especially nasty, they affect our pets in many different ways, some of them might not even show any signs of an infection, when others might end up being fatal. Humans can be affected by some of these worms, too. Accidental ingestion of roundworm eggs can lead to a variety of health problems in people, one of the worst being blindness. Children are particularly at risk as they often play on the ground or in soil where worm eggs may be present (in parks, sandpits etc). Adults may be exposed during activities such as gardening. So what are some of the ways you can avoid an infestation? Clean up your pet’s droppings as soon as produced or at least daily. Do not give your pet uncooked meat/offal unless you can vouch for its complete history. Treat your pet regularly against all parasites as instructed by your vet. If you have several pets, make sure to treat all of them at the same time. And if you are forgetful, Parasite Party offers a reminder service! All you have to do is to fill out a few details and you will receive a reminder email on the date you requested… it’s that simple! Treat your dog inside and out. Ask your vet about recent innovations in parasite control. First of every month marks my monthly pet check-up. Why the first you might ask? Well, it is easy for me to remember. I do my monthly invoices on the first, I pay my credit card bill, the month changes and it is one of those tasks I always do on the first of each month. All pet owners know that even a low maintenance pets need some care. When it comes to cats and dog they need much more attention than a fish or a turtle for example. There is quite a lot of things which need monitoring and checking up on, on a regular basis. 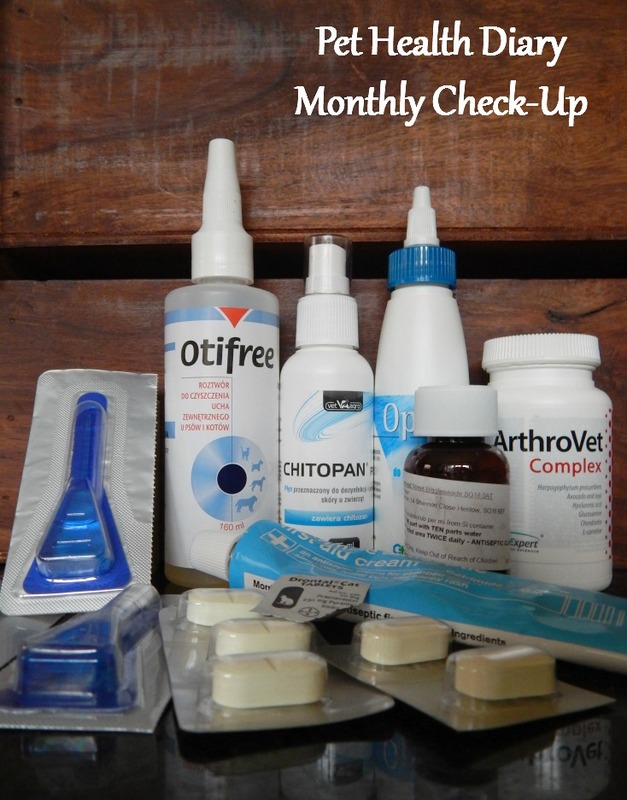 I have a list (kept safe in my head) which I run through during my monthly pet check-up. This is related mainly to Lilly. She has a weight problem, so my monthly check-up on how she is doing is a must. There is a great body condition tool on the Purina website, which can be a tremendous help for any dog owner. This one is especially important for Bunk. He gets hot spots and despite petting him daily sometimes they get missed. A full body check-over of the skin is a necessity for me. This also applies to our cats. They aren’t happy with the check-ups but I simply need to know if they are all ok.
As for nails – I don’t trim nails myself but I monitor them monthly and take the dogs to the groomer or vet if needed. This is also the best time for some preventing treatments. I treat all my pets with Frontline in order to keep them tick and flea free. The treatment is easy and as long as you have the correct product from your vet, you can easily do it at home. You can read more about fleas and ticks here. I buy an eye cleaner for my dogs. In most cases it is used if / when needed. Bunk is a very messy pup and from time to time things get into his eyes, things like his dinner for example. Then he rubs his eyes with his paw, making the irritation even worst. A few drops of eye cleaner and a cotton wool pad and done, shiny healthy eyes. Smelly breath isn’t nice. We have a no kisses policy anyway as standard behaviour in the house but as bad breath can suggest something more serious is going on with your pets health I like to check if their breath is still acceptable. At the same time I have an opportunity to check their teeth and gums; this is how I know that Lilly needs a trip to the vet dentist for some fang cleaning. This is our standard monthly routine. Every three months I am adding some worming tablets to the mix just to keep things on the safe side. Do you perform any health check-ups on your pets?